To understand the role of trace elements in cellular function a precise mechanistic detail of their subcellular location and binding partners is required. This can be achieved by cellular fractionation and liquid chromatography coupled to inductively coupled plasma mass spectrometry (LC-ICP-MS). The increasing use of size exclusion coupled to ICP-MS allows for the specific investigation of metalloproteins. This chapter details a general cellular fractionation procedure that separates cells and tissue into three components; (1) the soluble cytosolic and extracellular component; (2) membrane proteins and vesicular cargo; and (3) highly insoluble proteins found in pathological inclusions such as amyloid plaque, neurofibrillary tangles (NFTs) and Lewy bodies. 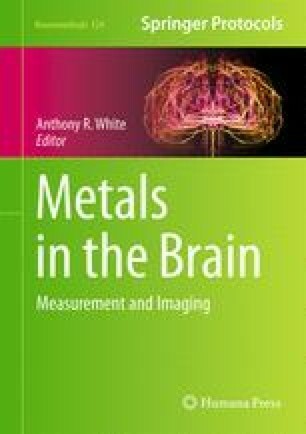 We also detail the methods to conduct a metalloproteomic analysis of soluble proteins found in biological samples with human brain as an example.